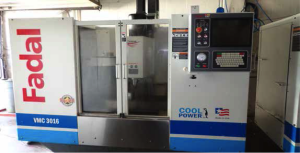 Processor CNC Controls, 21-Station ATC, CAT-40 Taper Spindle, 10,000 RPM, High Torque Spindle Motor, AC Drives, 4 meg Memory Expansion, High Speed CPU, Rigid Tapping, Graphics, 16” x 39 ½” Table, Coolant. 1994 Fadal VMC4020 mdl. 906-1 CNC Vertical Machining Center s/n 9401558 w/ Fadal CNC88HS Controls, 21-Station ATC, CAT-40 Taper Spindle, 7500 RPM, High Speed CPU, Graphics, 4th Axis Prewire, 20” x 48” Table, Coolant. Ingersoll Rand “Thermo Star” Refrigerated Air Dryer. Shars 24” Dial Height Gage. 8”, 6”, and 4” Digital Calipers. 36” x 48” x 6 ½” Granite Surface Plate w/ Stand. 20” x 30” Steel Surface Plate.